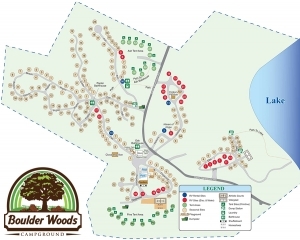 At Boulder Woods Campground our goal is to ensure a relaxing and friendly family atmosphere for your vacation or weekend get-a-way camping experience. We know that you have a choice of where you camp, and we want you to feel confident that we will meet all of your needs. Our guests are always our number one priority. Our campground is appropriately named for it’s beautiful abundance of trees and large rocks and boulders (left behind from the glacial era). We pride ourselves on being able to provide nearly any type of camping service that you could need, and we have beautiful wooded sites to accommodate RV motor homes, travel trailers, pop-up campers, conversion vans, and tents. Basketball/volleyball court, horseshoes, playgrounds, hayrides, activities, crafts, and much more. Free WiFi internet in various areas of the campground. We’re conveniently located in southeastern Pennsylvania, and serve the surrounding area. Please take a moment to browse through our site to learn more about our campground and what we can do for you. If you have any questions or comments, please feel free to contact us. We look forward to hearing from you.